The parish of Belém, just west of Lisbon’s city centre, has many monuments related to Portugal’s naval history and the Age of Discoveries. The Padrão dos Descobrimentos and the Torre de Belém have already been discussed. 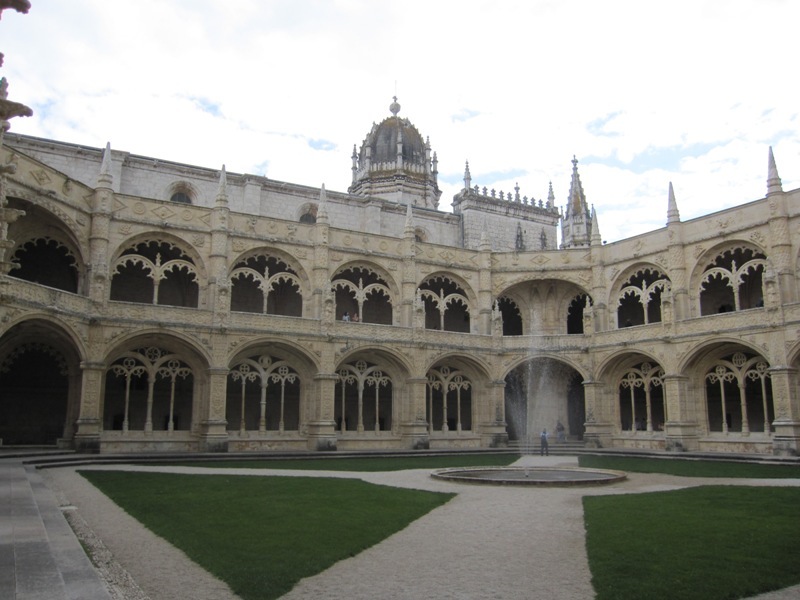 Yet Belém’s greatest treasure is arguably the awe-inspiring Jerónimos Monastery. It was built between 1501 and 1601 and can be considered a showpiece of Manueline architecture. It deservedly became a UNESCO World Heritage site in 1983. The monastery is located just north of the Padrão and the best way to admire it from a distance is to take the elevator in the Padrão to the observation deck and to take a look at the monastery from up there. The Jerónimos Monastery, seen from the Padrão dos Descobrimentos. In front of the monastery is the Praça do Império, a square with beautiful gardens and a large fountain. Behind it, one can see the stadium where Clube de Futebol Os Belenenses plays its home games. Parts of the monastery are now used for other purposes. The west wing of the complex is shared by the Museu de Marinha, the Maritime Museum, and the National Archaeological Museum. This is where the dormitories of the monks from the Order of Saint Jerome used to be when the monastery was still in use. As happened to all the other religious orders in Portugal, the Hieronymites were dissolved in 1834. In 2007, the Treaty of Lisbon – a treaty about the reform of the European Union – was signed at the Jerónimos Monastery. Planning of the monastery started in the late fifteenth century. There used to be a church at this location, founded by Henry the Navigator (1394-1460) and dedicated to Santa Maria de Belém. The clergymen here provided spiritual assistance to sailors who were preparing for new naval expeditions. King Manuel I (1495-1521) was still involved in the construction of the Batalha monastery, but decided to change his priorities and shift his attention to the construction of a monastery in Belém. Construction started in 1501 and it took 100 years to complete this impressive complex. Several architects would work on the Jerónimos Monastery. The first was Diogo de Boitaca, who also worked in Batalha. The Spanish architect João de Castilho (1470–1552), known for his work in Tomar, took over from him in 1517. Construction was temporarily halted when Manuel died in 1521, but resumed under the architects Diogo de Torralva (1500-1566) and Jerónimo de Ruão (1530-1601). 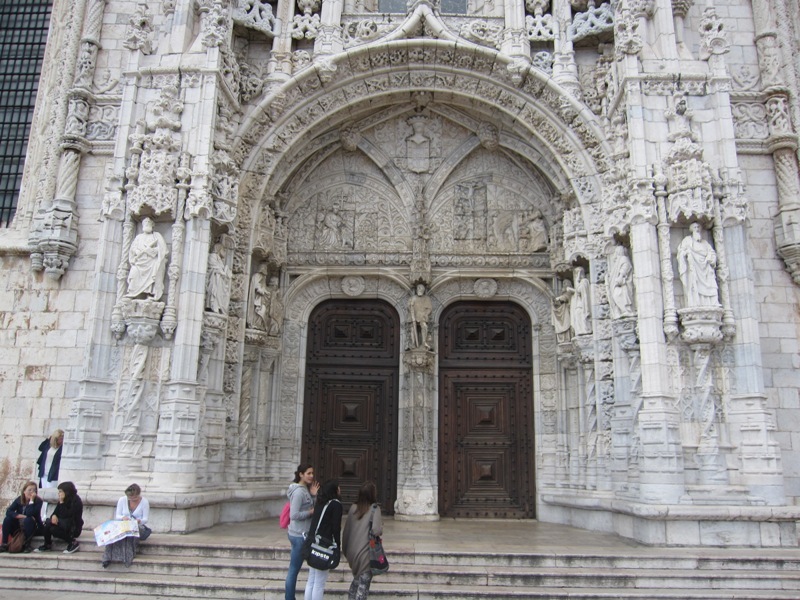 João de Castilho was responsible for the wonderful southern portal of the church. It is an impressive piece of Manueline sculpture. Above the doors are panels with scenes from the life of Saint Jerome (Hieronymus = Jerónimos). Jerome (347-420) was a priest who is best known for translating the Bible into Latin. He is often depicted with a lion. According to tradition, Saint Jerome healed a lion in the wilderness by removing a thorn from its paw. This can be seen on the left panel. The panel on the right shows Jerome’s experiences in the desert. Above the arch of the portal is the statue of Santa Maria de Belém. Between the two doors, one can find a statue of Henry the Navigator, Grand Master of the Order of Christ and patron of many of Portugal’s naval expeditions. The portal is topped by the cross of the Order of Christ. While certainly the most spectacular entrance to the church, the southern portal is actually just a side entrance. The main entrance is the western portal, sculpted by Nicolau Chanterene (ca. 1485-1551). This French sculptor is also known for his work in Óbidos and Sintra. Once inside the church, the visitor can find the tombs of the great explorer Vasco da Gama (1460/69-1524) and the famous poet Luís Vaz de Camões (ca. 1524-1580) in the lower choir. These are not the original tombs. They were in fact sculpted in the late nineteenth century in Neo-Manueline style. On Vasco da Gama’s tomb, we see familiar elements, like the cross of the Order of Christ and an armillary sphere. In the centre of the tombs is a caravel, the ship the Portuguese used on their voyages. 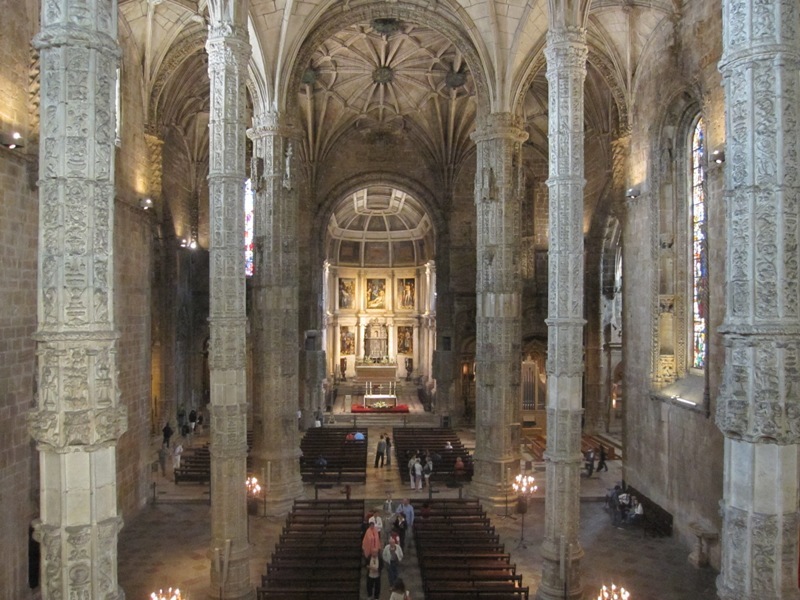 The church of the Jerónimos Monastery is clearly a hall church. The aisles are about as high as the nave, unlike in a classical Roman basilica. The elegant ribbed ceiling is supported by slender columns. They are highly decorated, but look a bit flimsy. In the apse, one can find the royal tombs of King Manuel I and his Spanish wife Maria of Aragon, daughter of Ferdinand and Isabella of Spain. 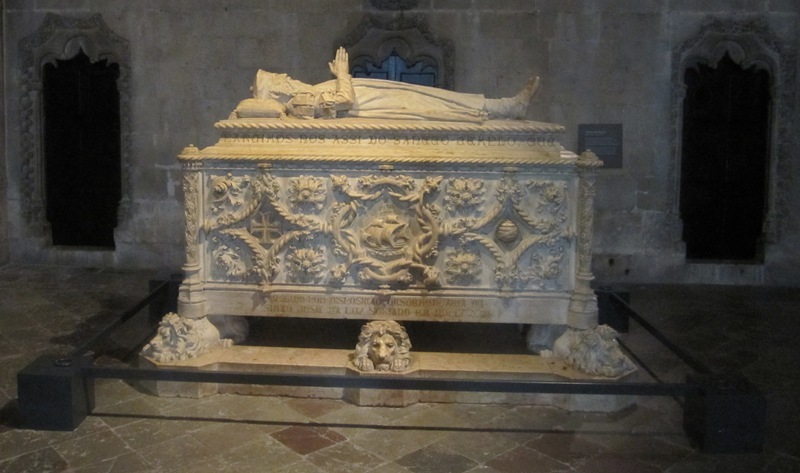 Also located in the apse are the tombs of Manuel’s son and successor, King João III (1521-1557) and his wife Queen Catherine of Austria. Note that the tombs are supported by elephants. Catherine of Austria (1507-1578) was the posthumous daughter of Philip the Handsome (1478-1506), son of Maximilian of Austria, Holy Roman Emperor. Her mother was Joanna of Castile (1479-1555), also known as Joanna the Mad. Interestingly, King Manuel I was first married to Joanna’s older sister Isabella, but she died in childbirth in 1498. Manuel then married Joanna’s younger sister Maria in 1500. When Maria died in 1517, Manuel married for the third time, this time to Eleanor of Austria (1498-1558), who was Joanna’s daughter. Joanna’s younger daughter Catherine married Manuel’s son João in 1525. This all shows the close relations between the royal families of Portugal, Castile and Aragon. Of course, Joanna is still best known for being the mother of two Holy Roman Emperors, Charles V and his brother Ferdinand I. Not bad, for a Mad Queen. King João III and Catherine of Austria had nine children, but all of them died young. His son João Manuel (1537-1554) died aged 16, but had already fathered a son, although the child was born posthumously. When King João III himself died in 1557, he was succeeded by this child, Sebastião, his grandson. King Sebastião presumably died in the Battle of Ksar El Kebir in 1578 while fighting the Sultan of Morocco. His army was annihilated and his body was never found. 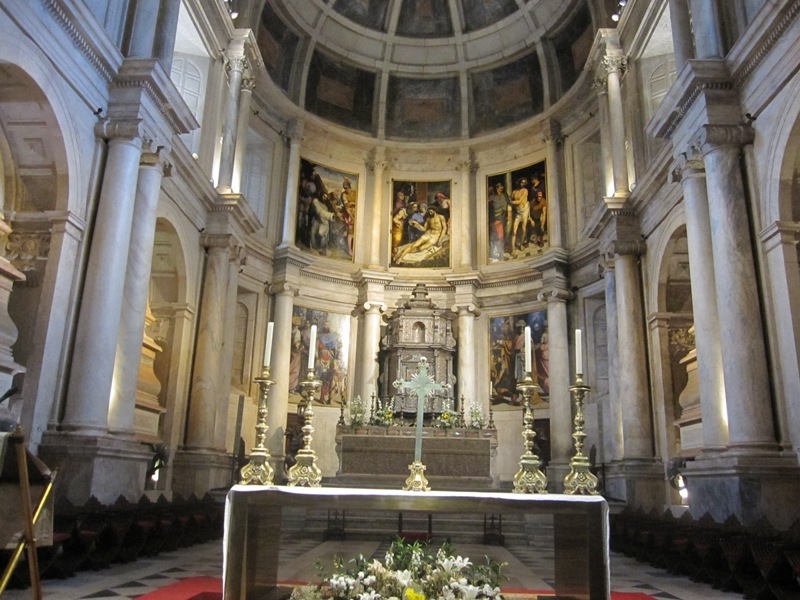 That is why his tomb in the church of the Jerónimos Monastery – to be found in the chapel of the right part of the transept – is empty. The death of the king threw Portugal into chaos, virtually ended the House of Aviz and ultimately led to the annexation of Portugal by Spain in 1580. Work on the cloister was started by De Boitaca and then continued by De Castilho. The cloister was completed in 1544. It is a pleasure to walk around here. The atmosphere is peaceful and serene, and the windows, arches and balconies are all beautifully decorated. To the left of the cloister is the refectory. To the right one can find the chapter house of the monastery. If you are in Belém, don’t forget to try the world-famous pastéis de Belém! These egg tart pastries were originally developed by the monks of the Jerónimos Monastery. You can find them at the Fábrica de Pastéis de Belém.